Erin Mirabella represented the United States in track cycling at the 2000 and 2004 Olympic Games. Erin's career highlight came at the 2004 Athens Games, where she placed 4th in the points race. In 2006, she was the recipient of the prestigious Jack Kelly Fair Play Award for sportsmanship. Erin has used her experiences as an Olympic athlete to create a series of children's books, The Barnsville Sports Squad. The newest book in the series, Shawn Sheep The Soccer Sta r, was released July, 2008. Erin lives with her husband Chris, their son Micah, and daughter Lindsey in Woodland Park, Colorado. Track cycling is a type of bike racing done on a special cycling track called a velodrome. 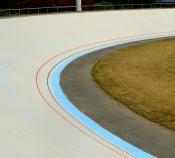 Velodromes are oval and have banked sides; they look like an oval bowl. Like track and field, track cycling has a wide variety of events. Some events are short, fast and explosive, others are time trials against the clock and some are longer, extremely tactical races. Cyclists compete in track racing at a local level all the way up through the Olympic level. The thing that makes track cycling different from other kinds of bike racing is the bike. Track bikes have no brakes and only one gear.